Starters seem to freeze all of the time... all it takes is a quick dunk underwater and a truck to sit outside over night. My Cherokee use to do the same thing, but it would only be frozen in the morning after sitting outside...After getting it started that day, I would never have another issue until the next morning. It usually takes a couple days of above freezing temps to get rid of the water. Of course, there's still water inside, so it will take a few days of garaged or in above freezing tempts to get rid of the issue. Since you guys are probably getting hit with some snow, thought I would pop this thread back to the top for any new guys that haven't had much experience with cold weather wheeling/camping. I had plans to go out and wheel this weekend, till I got sick and stuck in bed (which is where I am currently). Since I sold the camper and I am now currently back in a tent (blah), its back to roughing it I guess, none the less, I planned on buying a -20 degree sleeping bag for this weekend prior to my sickness. Winter camping is almost as much fun as winter wheeling.. was wondering what your guys experiences have been with camping in below 0 degree weather. The WINTER CAMP TO-DOs and DONTS. You could try and sleep in the samurai, those seats recline right? There was a "camper" samurai on the trails down here last year till it had a roll over and destroyed the shell, I should see if I can find pictures online. Started going through all of my old gear and seeing what is still usable and what is not. Thinking about posting up pictures after I gather everything together. I am curious to see what you all have as well. And I guess we can split it up into 3 different groups: Tent, Vehicle, and Camper. Maybe Mike will chime in on this now that he has his coleman. Not sure if he has used it in the cold yet or not. I think Samurai camping would be more like yoga. . .
(11-19-2013 06:02 PM)Dmiller Wrote: Right now, I am currently worried about running chains. I am fully locked with 'fuzzy' lockers and being able to spin a tire around a corner is actually fundamental to my set up. Chains have so much grip that I am worried about breaking an axle shaft or destroying the pin/spiders. For those of you who have open diffs or auto lockers, it will be much less of a fear. How did the old Blazer fare with chains? Would you recommend running the tires a street pressure or aired down with chains? I picked up a surplus set for the burban a while back but have not had a chance to use them yet. I would personally leave the tires aired up, I would think the more the tire deforms its original shape, the more the chains will want to walk off. What kind of chains are they? The blazer did good although I didnt really run them at any events. Chains are really just unstoppable. My father took my old chains I had and cut them down to fit his 38s, he ran them last winter at the STORC event. From what he was saying and others that were there, with a few high horsepower, big tire buggies there.... None of which could keep up with him and the chains lol.... and he only ran them in the back! Honestly, you could probably throw chains on a stock jeep and have it go farther than high end buggies... Thats how big of an advantage it is. Standard issue HMMWV chains, nothing fancy. New, never used, still covered in Cosmoline. They are meant for my tire/wheel combo, so they shouldn't walk off. 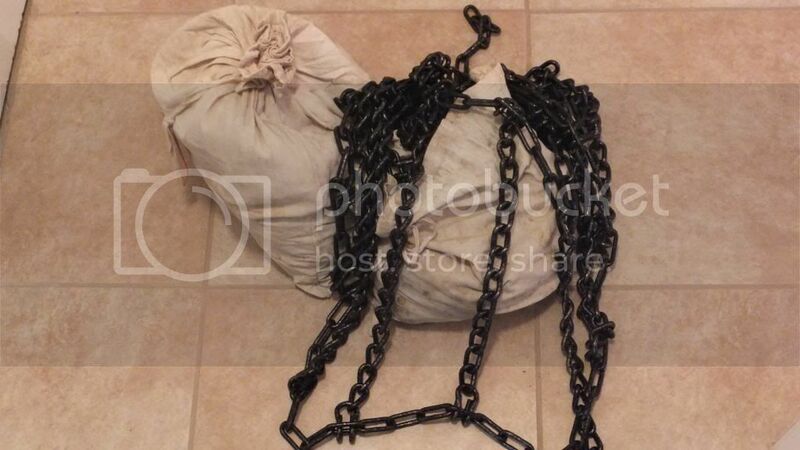 I have been debating getting a set of chains for the Cherokee. The 235/85-16 I have is a pretty common size, so they wouldn't be terribly expensive. Or I could make a set ... but that seems like it would be a lot of work. And, I'm willing to bet, it's a really good way to break something when dealing with stock Jeep axles. I haven't had the P'up out in the winter. Would be interesting to try some time. They aren't too air tight and the canvas is made to "breathe" so I bet it could blow through. There was an optional heater, but that wasn't optioned out on mine. I do think the Canvas might be thicker than a tent and hold in a bit more heat. I think it would be fine on the jeep. One of the local guys runs chains only on the front, which is a locked dana 30. My father only runs them in the back of his CJ, locked dana 60. I could see being locked up and the chains binding potentially breaking an axle shaft, but I really think it all depends on how hard your on them. If you had open diffs, I really don't see any additional failure potential. I don't see a reason to run all 4 tires in chains unless you already have them. This is a good friend running front chains on her jeep.